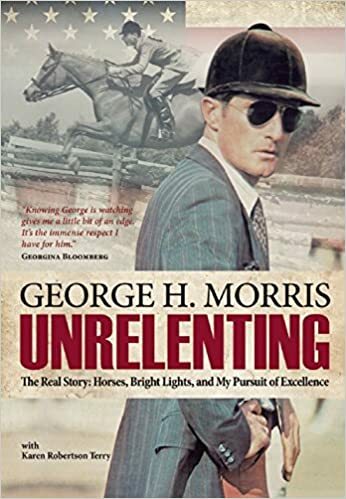 So, George Morris’ autobiography Unrelenting: The Real Story: Horses, Bright Lights and My Pursuit of Excellence is here. We have decided to give away one copy of the book, and as George says in the beginning, it’s not for the faint of heart. He breaks his life down by decade, doesn’t leave anything out, and is incredibly honest and raw. The book is long (I haven’t finished it yet), but incredibly interesting and peppered with short quotes from those who have known Mr. Morris over the years (and others from George himself that will make you chuckle – see above). It’s an incredible look inside what made Mr. Morris into who he is today. ps. Did you know he used to be a timid, unconfident rider? Yeah, that surprised me too. If you can’t get a copy or can’t afford it right now, we want to help you get to know the man behind the magic. Enter our giveaway here! It runs until the 18th at 12 am. And if you want to pick up the book yourself, click the link above to get it on Amazon! They have copies in stock. No matter what your feelings on Mr. Morris – he has had an incredible influence on our sport and produced some incredibly talented riders.